Discover Blair Castle and go on a journey into the fascinating past of the Dukes and Earls of Atholl. 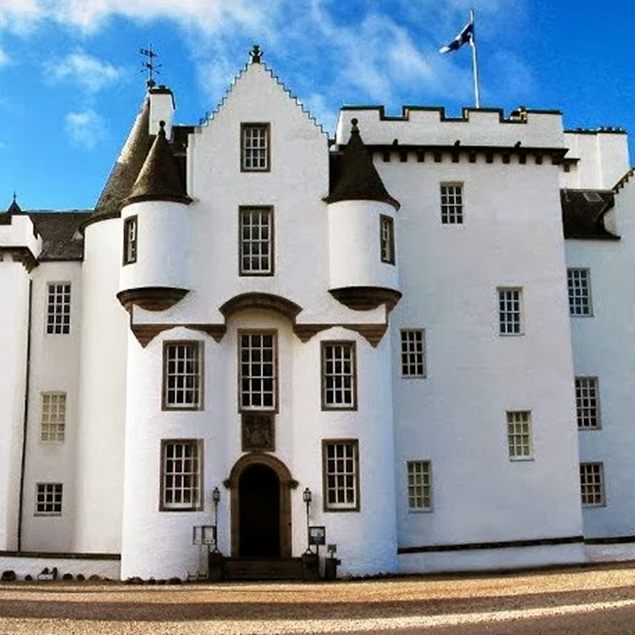 Unique amongst Scottish castles, the story told here will take you from a visit by Mary Queen of Scots to the Civil War, and from the Jacobite cause to the disaster of Culloden following Bonnie Prince Charlie's own stay in the castle. You'll hear how the lucky inheritance of a smuggler-infested island helped turn the castle into a comfortable home, and learn how Queen Victoria's famous stay led to the creation of Europe's only private army, the Atholl Highlanders. Dating back to 1269, the castle has been transformed through the ages, from its cold medieval beginnings in a strategic position during political struggles to become a fine Georgian mansion and finally a Victorian castle in the barionial style. These influences can still be seen today across the 30 rooms on full display. Queens View. Queens View is probably the most photographed view in Scotland. There is very easy access to the view, which is probably part of its popularity. A short walk from the car or coach, up a newly constructed gentle incline, which makes it very easy for wheel chair users to see the view too. Local tradition has it, that it was called 'Queen View' after Queen Isabella, King Robert the Bruce's Queen's who is alledged to have visited the site in the early 14th century. When Queen Victoria stopped and took tea at the spot in the mid 19th century, she wrote in her diary that "they have named this place after me, although I do not believe I have ever been here before" or words to that effect. The problem with being such a high profile monarch, I suspect is that no one dared put her straight on the matter. Queens View today is run by the Forestry Commission of Scotland, it has a small shop and cafe (run by as a franchise), along with the public toilets, all these faciltiies are only open during the main tourist season from April to the end of October each year. The view itself and the car park is open all year round. There is a small fee of £2 per vehicle no matter how many passengers your vehicle has in it, as a small levy to help with the upkeep and maintanace of this very popular site. Queens View is a short drive (approximately 15 mins) from Pitlochry, as you head out towards Killiecrankie, you take the turning to Tummel and Rannoch. The Highland Chocolatier has a dedicated chocolate visitor centre, free entry, where you can learn about the wondrous ways of turning cocoa into the most sought after and adored of all confections, the gourmet chocolate shop is popular with locals and visitors to the area. Birnam Arts & Conference Centre has an association with Beatrix Potter through an exhibition featuring her family's long holidays in Scotland (May to the end of the salmon season in October) inspiring enduring influences upon Beatrix's development both as an artist and scientist. The Scottish Crannog Centre was built as a result of underwater discoveries dating back 2,500 years. It is a living experiment, that has a 'Gold Award' for best practice in environmental management and is a 5 star visitor and educational centre. The Dunkeld Hermitage, The Hermitage (Officially the Hermitage pleasure ground), at Dunkeld was created by John Murray the 3rd Duke of Atholl, in the mid to late 18th century as part of his home, Dunkeld House - to heighten his guests experience thrill and shear enjoyment as they walked to view the falls.